Toeing the Rubber » What the Hell Happened? 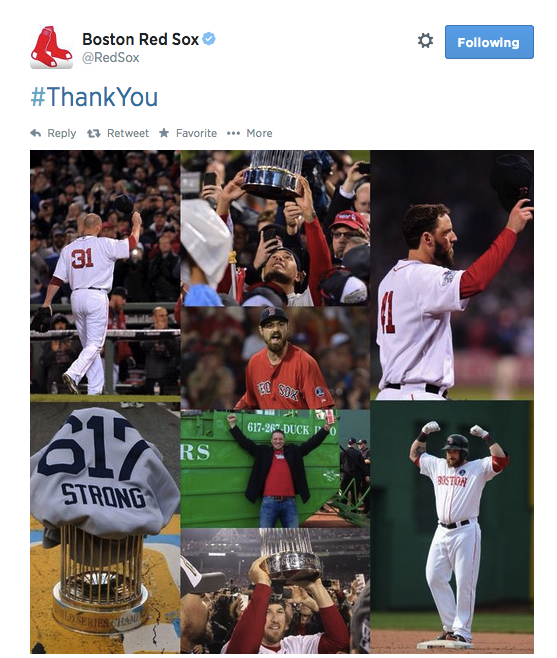 The official Red Sox Twitter account tweeted this out this afternoon. Have to admit that it got a little dusty in my office when I saw it. I took yesterday as a (legitimate) sick day and had planned on spending the day sleeping off the ER’s treatment of a very bad allergic reaction I had the day before. But I forgot one thing. I forgot to shut off my phone. And my phone stays pretty close by. So while I’m in a medicinally induced deep sleep, around 10am or so my phone starts, as they say, blowing up. Forgetting what day it was, I immediately think something must be terribly wrong so I force myself up and start reading all the various text messages and emails that were coming in. The unthinkable happened. The Red Sox traded Jon Lester. So the Red Sox traded longtime fan favorite and pretty freaking good left-handed pitcher Jon Lester to the Oakland A’s and threw in Jonny Gomes and some cash for good measure. Had they not received Yoenis Céspedes (and a competitive draft pick) in return, I’m sure there would have been a lot more hand-wringing, garment rending and teeth gnashing from the people in my Red Sox circles. But there was very little of that going on with them yesterday. Don’t get me wrong, you’ll find it in plenty of places. For example, in the comments section of a boston.com piece this morning someone lamented that the Red Sox haven’t been in the playoffs in four out of the last five seasons. Writing that in July of 2013 would have been relatively legitimate. But today? Yesterday? You can’t pretend that your team isn’t the reigning World Champion team just because they’re lousy right now. Doesn’t work that way. Also, as a not so moot point, From 2002-2013 the Red Sox have been in the playoffs seven times. Five out of those seven times they made it to the ALCS. Three of those American League Championship Series appearances let to World Series wins. So in 11 years the Red Sox have been in the playoffs seven times, made it all the way to the ALCS five times and the three times they made it to the World Series, they won every time. After the Lester/Gomes news dropped, Red Sox fans thought they could breathe a little easier the rest of the day. Hell, by 10:30am ET we knew the details of the trade (I spent a good part of the morning practicing how to pronounce and spell Yoenis Céspedes) and were chuckling at the fans of other teams who would have to wait ALL DAY for their torture to be over. Fools. By the end of the day, the Red Sox traded away John Lackey (and minor league left handed pitcher Corey Littrell) to the St. Louis Cardinals, Andrew Miller to the Baltimore Orioles and Stephen Drew to the New York Yankees. All players (with the exception of Littrell) who had a hand in giving the Red Sox and their fans a third World Series in the 2000s. That things could spiral out of control so quickly that they end in the Red Sox trading away four out of the team’s five starting pitchers (as of Opening Day, anyway) is still something that boggles the mind. But here we are, 108 games into the season and Anthony Ranaudo is your starting pitcher against the Yankees and Allen Craig is starting in left field. Below is the starting lineup for today’s game. I’ve helpfully put the player’s ages next to their positions. Looking at it written out, it actually doesn’t seem that terrible. I mean Ranaudo and Craig are the only two who haven’t played for the Sox this year. Over the last couple of months they’ve probably put out worse lineups (just based on player performances). But, man, it’s still surreal to me. Not necessarily in a bad way, mind you, but surreal just the same. After the initial “Wow, they really traded him!” after the Lester news came out and my surprising sadness over Jonny Gomes heading back to the west coast, I realized that for the first time in years I was genuinely excited to see what the Red Sox were going to do on deadline day. Excited beats nauseous (which I usually am on July 31st) any day of the week. Ask the fans of other teams…let’s say the Cincinnati Reds for example…if they’d take what we as Red Sox fans have experienced since John Henry, Tom Werner and Larry Lucchino took over ownership of the team compared to what they’ve gone through with their own team. Most fans would switch with us in a heartbeat. And one of the reasons this team has had the successes it’s had is because when things go south they’re willing to make moves like they did yesterday to ensure the team won’t forever dwell in the cellar. Without some otherworldly interference, the Red Sox won’t be seeing the playoffs this season. But Ben Cherington showed the baseball world that he isn’t willing to sit back on his World Series Championship and let the ship sink. On paper this team isn’t as good today as it was Wednesday – but I’m pretty damned excited at what could be in store for this team thanks to what went on yesterday. *Okay, one thing about Stephen Drew…unlike, apparently, many other fans, I hold no ill will toward the guy. He was a huge part of winning 2013 and when I think of him it will always be with much fondness for that. So, regardless of how he performed in the short time he was with the team in 2014, it will pain me to see him in Yankees pinstripes. Absolutely pain me. I wish him well but I also hope he ends up with another team next year not in the Bronx. well. . . they sure made a dent in the “what will we do for power in the order going forward?” question. And I like the moxie in the pitcher they brought over in the Lackey trade; I don’t know what Kelly’s long term prospects are–number four starter? number three?–but in his first outing against his old club, he was nails, competitive-grit speaking. Whenever Craig heals up, hopefully he’ll return to something like 2011-13 form. And hopefully Cespedes will enjoy the Wall so much he’ll settle in and mash for many moons. And the rest of the season will give us a good look at the kids. But we gonna need to pick us up some P I T C H I N G this off-season. Here’s hoping they get a reliable picture of who they have in that stable of young’uns, keep the thumb’s-up fellers, package the not-so-sure dudes in a deal for somebody solid, and…magically pony it up for Jon Lester. Would five years for 125 get ‘er done? Am I dreaming (my customary occupation)? Only Jon and John Henry know for sure. But of all the free agent pitchers this winter, he’s the one I’d pony up for, for about ten reasons.